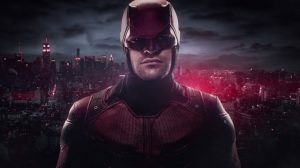 Kyle and Claire dive into the Netflix Original Series, Daredevil. Claire takes us on a tour of the comics and discusses the many friends, enemies, and lovers that have made Matt Murdock the man he is today. It isn’t easy being Daredevil’s friend—or his enemy. Kyle covers the planning and production of the show, including the negotiations that brought the television rights back to Marvel. He also gushes over some of the best fight choreography in the business. Our hosts conclude with their thoughts on a violent show made lovingly by comic book fans for comic book fans.